AcclaimIP is the fastest, most intuitive patent analytics and landscape solution available. With over 200 clients from around the globe, including Fortune 100 and IP 100, we are a catalyst for corporate and firm advancement in IP intelligence. Our mission every day is to help our clients get smarter and more knowledgable about patents, analysis, and innovation management. From the micro "do we patent this?" to the macro "where should we be investing in R&D and IP?" - we empower our clients to answer the call and compete better. With industry-leading data quality, performance, and stability - our data processing and advanced search engine allow for unparalleled speed, taking integration and scalability to new levels in IP research. Automated landscapes, dashboards, custom data integration, and unparalleled data transparency will transform the way you look at patents. Built on the learnings of million's of users and 100's of millions of searches, and over a decade as experts in patent research and data services, AcclaimIP draws from technical and IP experience that is truly unique. From the independent consultant to the Enterprise, AcclaimIP provides a solution for every stage of your evolution, meeting your growing IP analysis, collaboration, and integration requirements. Intuitive Windowing Interface–Data appear in a few simple windows. Powerful Document Details–More convenient than reading a patent pdf. AcclaimIP includes patent information not found on the patents, including forward citation, assignments, maintenance, and family data. Easy Expert Syntax–Concise expert syntax supports powerful tools such as proximity, term boosting and nested Boolean searching and almost 100 unique field codes. A well designed user experience isn’t just a collection of hundreds of features. It is how it all comes together in one intuitive and easy-to-learn package. Patent data is meticulously organized, and just where you expect it to be. AcclaimIP is designed to be incredibly efficient. Even the help files are there when you need them–in context of your searches. Most users can use all but the most advanced search techniques without ever having to refer to our extensive online help. Fast Database–Over a decade delivering world-class search engine performance. Fast to Visualize–Choose from 20 charting variations for exquisite patent landscape analyses. Fast Results–Supports common workflows and quickly delivers patents of interest. Fast Paging–Page through patent details in less than one second per patent. Speed is a requirement when researching patents, not only are there 10’s of millions of documents that have to be queried quickly, but also, high speed systems encourage you to fully investigate the patent database, allowing you to take detours and investigate certain patent owners, inventors, and classifications in real-time with no waiting. But that’s only half the story. AcclaimIP lets you be incredibly accurate and comprehensive in your searches too providing you all the tool required to get your job done…fast! Filter by Dates–Narrow your searches to particular file, priority or publication/issue date. Filter by Useful Data–Filter by agents/attorneys, inventors, active/expired, small/large entity, country of origin. Filter by Meta Data–Active/Expired, Small/Large Entity, Country of origin. Filter by User Defined Data Fields–All your custom data fields have corresponding filters. Patent searching is an iterative process which starts very general then over subsequent refinements, the results get more and more targeted. AcclaimIP’s filters are designed to help you confidently narrow your searches to just the areas that truly interest you and filter out all the noise in your searches. You won’t have to rely on inaccurate, dangerous, and misleading keyword refinements! 40 Sortable Columns of Data–Nothing else is like it. Arrange columns they way you want to get the job done faster. Customizable–Your entire experience, from the size of your windows, to what appears in them, even to their colors and background colors can be customized for the specific task and your personal preferences. Global Patent Data–Includes US, EP, WIPO, and DE full text and extensive patent family data. Extensive Charting–Wide selection of charts, graphs and visualizations to visualize patent landscapes. Natural Language Searching–Use a patent or any block of text as your query. Document Clustering–Groups patents into thematic sets. Keyword Extraction–Multiple tools to extract keywords from single patents or large sets. Auto generates suggested queries to find patents similar to your target set. Query Matrices–Execute hundreds of queries simultaneously for one click comprehensive patent landscapes. Efficient patent searching requires are large toolset to be both efficient and comprehensive. 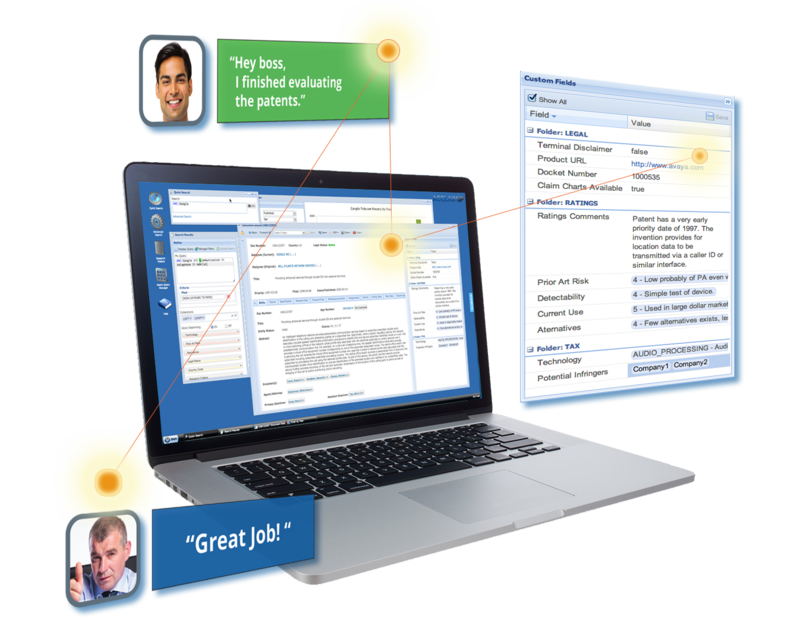 AcclaimIP brings together hundreds of features in one seamless and easy-to-learn experience. In addition to our newly added MPEP and educational and fascinating Blogs and articles, we also have patent data visualizations, scientific literature, and related tools. Check out the Patent Map to see how your area (in the United States) is doing with respect to patenting activity, use our citation tools to quickly enhance your own articles or blogs, view patents organized by University and more. We are always adding to these great tools, so check back often for updates!